The morning after winning the 2014-15 Turkish Airlines Euroleague title, Real Madrid marked the end of its celebrations for its ninth continental crown by sharing the trophy with their fans in the Spanish capital on visits to the Comunidad de Madrid headquarters and to the Madrid city hall. The first stop of its parade was Puerta del Sol, where Final Four weekend had started officially with a One Team event and the Opening Press Conference. The Madrid players, coaches and employees arrived by bus from Santiago Bernabeu stadium. At 12:15 CET, all 13 Madrid players and the coaching staff showed up at the Comunidad de Madrid headquarters and gave the regional president, Ignacio Gonzalez, a jersey signed by all of them. Right after that, Gonzalez gave a commemorative plate to the club before president Florentino Perez and team captain Felipe Reyes said a few words in a very emotional event that had the Euroleague trophy as its centerpiece. "The Euroleague trophy is very special, because we were really close to win it in 2013 and 2014," Reyes said. 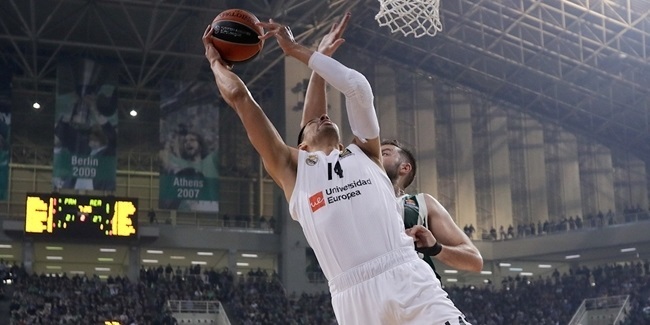 "We have put Madrid back where it belongs, the highest spot possible: we are the Euroleague champions. Thanks to our fans, we owed this trophy to them, and to our president, Florentino Pere, because this wouldn't have been possible without his support." Florentino Perez said that this title was missing in a unique roll of honors. "We promised it and here it is," he said. "Real Madrid never gives up: it stands up and keeps fighting. This Euroleague is the reward to everyone's hard work. Twenty years is a lot and that makes it even more special. We are still the club with the most European titles in two big sports, football and basketball. Our players showed the playing style that has been our identity throughout our history. Congratulations to everyone!" 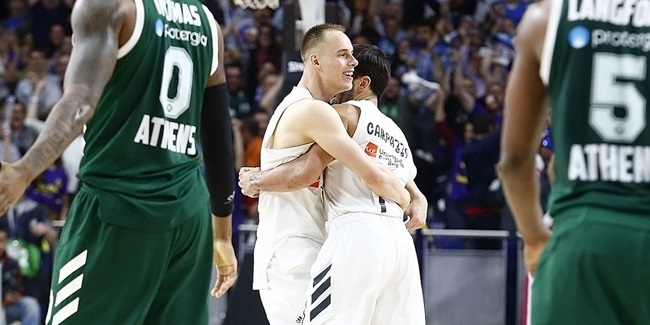 Perez did not lose the chance to praise basketball director Juan Carlos Sanchez and the work of sports manager Alberto Herreros, two of the architects of this team and its recent success. Moreover, he wanted to thank Gonzalez for the support he showed to Real Madrid after the team lost the Euroleague finals in 2013 and 2014. "We will never forget your support, as I don't want to forget about the success of our junior team, which is also the best in Europe," Perez added, finishing his speech with good words for his team's players. "Real Madrid's law is to always compete, and to never give up. You managed to achieve the goal we dreamt about. The history of the winningest club in Europe is a little bigger now." Gonzalez thanked the Madrid team for bringing the trophy to the Comunidad de Madrid headquarters. "The trophy makes Real Madrid's legend even bigger," he said. 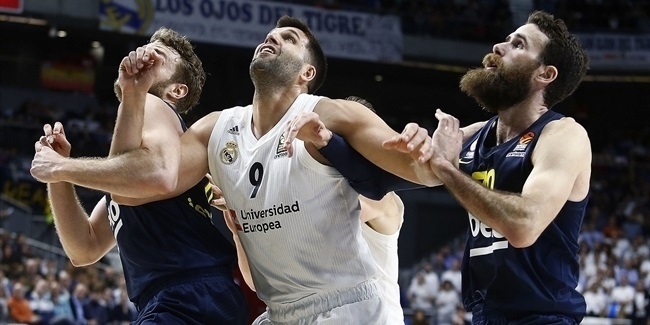 "They were really close to lifting it in 2013 and 2014, but we had such faith in the club that the Comunidad de Madrid made a strong effort to bring the Final Four to our city. We are extremely proud of you. With this ninth Euroleague title, the new era of success which started not so long ago is confirmed. Felipe Reyes was missing this title in his personal roll of honors. Congratulations to him and everyone. We are really proud to know that we have the best team in Europe. As one of my last acts as Comunidad de Madrid president, I couldn't have asked for a better end to this job." After that, the parade had another stopped in Cibeles square, where the Madrid City Hall is located. Real Madrid offered the newly-won trophy to the Mayor of Madrid, Ana Botella, who said it was an honor to receive the club and the trophy that "had resisted being lifted in the last few years." "You deserve it more than anybody else," Botella told Real Madrid players and coaches. "Real Madrid is already in the heart of this city. "We made an obsessive dream come true, surrounded by our people," Perez said at the city hall. "For the second time in history, a team was able to win the Euroleague and the junior tournament, but we always want more. That is the indestructible spirit of this club and this is why this group is able to keep adding to its own legend. We will enjoy this Euroleague title and after that, fight for a Spanish League title that would complete a magical year." The celebrations did not lack for words from winning head coach Pablo Laso and Andres Nocioni, the Final Four MVP. "These have been four very intense days, with a big emotional baggage and two physically demanding games," Laso said. "We had to get a lot of things ready to get these two wins. I am tired, but also satisfied. Working for Madrid is demanding but allows you to enjoy every title: you have an obligation to do it. Now, we are already talking about the Spanish League title. It is normal, it is what it is and we accept it. It is very difficult for a coach to disconnect: you always think on new stuff, even in summer. At least, that is the way that I am. But yes, I am enjoying, especially to see my players so happy and to be able to celebrate together." "I just played and tried to do things the best I could. I believe that the team did this, all of us. We worked really hard. The team showed a lot of character after losing two finals, being able to win on Sunday. I am very happy and satisfied for the character that the whole team showed. It is normal to have adjustments in a team, that new people arrives, but I think us, the players who arrived last summer, adjusted to the team well and that is mainly because of the players who have been here for many years. They made that easy for us. I hope that it will not take us another 20 years to win another Euroleague title, but we have to know that winning the Euroleague is really difficult. There are a lot of teams that have been looking for such a big title for many years and still didn't get it."